If you are experiencing dry, itchy skin with scaly red patches, you could be suffering from eczema. 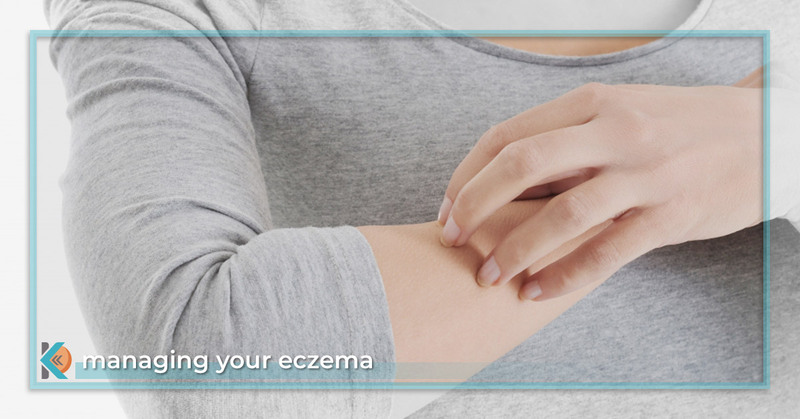 If that’s the case, you’re not alone; an estimated 1.6 million American adults experience eczema as well. We’re all too familiar with eczema at Kallgren Dermatology Clinic, and we’re happy to help you finally find some relief. Today we would like to discuss eczema in more detail. Symptoms of eczema include irritable, dry, itchy skin with a scaly, thickened rash. Both babies and full-grown adults can suffer from eczema. Babies usually have eczema in their scalp and face, the backs of the elbows, and the front of their knees. Adults often experience a rash on their elbows, knees, and nape of the neck. Have you ever suffered from an awful rash after being exposed to poison ivy? It itches like crazy, but the more you scratch it, the worse the rash. Similarly, with eczema, you should not be scratching your rash because it creates micro tears in the skin barrier, which triggers inflammation. When your skin becomes more inflamed, it will feel itchier. According to a 2015 study in the Annals of Nutrition and Metabolism, people suffering from eczema (also known as atopic dermatitis) are more likely to develop food sensitivities, food allergies, asthma, and a sensitivity to airborne allergies. People with eczema can experience anxiety or depression as a result of their skin condition, impacting the quality of their life. Due to the excessive dryness of this skin condition, proper moisturization is key. Stay away from moisturizers that irritate sensitive skin, which includes any lotions with glycolic acid, salicylic acid, or retinol. Also refrain from using any skincare products with methylparaben, butylparaben, or any fragrances, which can all contribute to inflammation. Because people with eczema have such sensitive skin, they need to pay attention to the type of laundry detergent they are using. We recommend switching to hypoallergenic detergents that are devoid of any fragrances, dyes, and residues that could irritate your skin. Other products that could contribute to a flare up include harsh chemical cleaning products, soaps, and shampoos. Allergens and stress also contribute to irritation, so make sure to practice self-care by exercising, eating a healthy diet, and getting a sufficient amount of sleep. If you suffer from eczema, it’s best to follow the above guidelines. Over many years, we’ve helped people manage their eczema through using topical creams and ointments to help heal the skin barrier. Depending upon your skin condition, we might prescribe antibiotics, antihistamines, or steroids to help control your flare ups. By controlling your eczema, you can live a fuller life without feeling embarrassed or self-conscious. We customize all treatments to suit the unique needs of each patient so that you can experience the most effective results. By following the above guidelines and creating a customized treatment plan with your Boulder dermatologist, you will have the tools you need to keep your eczema under control.